July in Vancouver is packed with not-to-be-missed events, including Canada Day, outdoor theatre, concerts, festivals, and the famous fireworks competition, the Celebration of Light. Dubbed the “best jazz festival in the world” by the Seattle Times, this annual festival includes hundreds of top jazz musicians and concerts at more than three dozen venues across Vancouver. Founded in 1986, the ten-day festival is run by the non-profit Coastal Jazz and Blues Society. Some participating venues offer free admission. It's scheduled to coincide with Vancouver's Canada Day celebrations. Downtown Vancouver's biggest Canada Day celebration is held at Canada Place, and includes free live music and entertainment, the annual Canada Day Parade and a fireworks show. Nearby Surrey has the largest Canada Day celebration in western Canada, and the biggest fireworks show in British Columbia. This free annual festival celebrates Latin American culture with food, music, dance lessons, soccer, kids' activities, and more. It's usually held on Granville Street, between Smithe and Hastings, in Downtown Vancouver. Dates vary from year to year, but it's nearly always held sometime in mid-July. The free Khatsahlano! Music & Arts Festival is Kitsilano's biggest street party, featuring 50 of Vancouver’s top musical performers, street performers, artisans, and special activities. Vancouver’s legendary Folk Music Festival covers three music-filled days at Jericho Beach, with eight stages, 70 hours of music (folk and world music) a festival market, and food vendors. Surrey Fusion Festival is Surrey's biggest two-day multicultural celebration, with has 40 international pavilions celebrating music, food and culture, a World Music Stage and a Celebrations dance stage. It's free and held in Holland Park. North Vancouver hosts the biggest Caribbean event--and the biggest single-weekend event--in B.C., with two days of tropical cuisine, culture, music and more at the Caribbean Days festival. Free events include a parade and a waterfront party concert with live music. The annual Festival of Meat showcases locally-sourced meats with food, cooking demos, and beer pairings. The Powell Street Festival is an annual celebration of Japanese Canadian arts, culture, and heritage that features dance, music, film and video, visual arts, martial arts demos, an amateur sumo tournament, craft vendors, traditional displays, and tons of Japanese food. Usually held sometime in late June or early July, Pride Week--leading up to the annual Vancouver Pride Parade--kicks off with the Pride Walk & Run in Stanley Park, and includes the Davie Street Block Party and famous Terry Wallace Memorial Breakfast. It's held at various locations across Vancouver, and many events have free admission. Vancouver's world-class Pride Parade features more than 150 float and parade entries, a party for 80,000 people at Sunset Beach (the Pride Festival, immediately following the Parade), and draws more than 700,000 people annually. 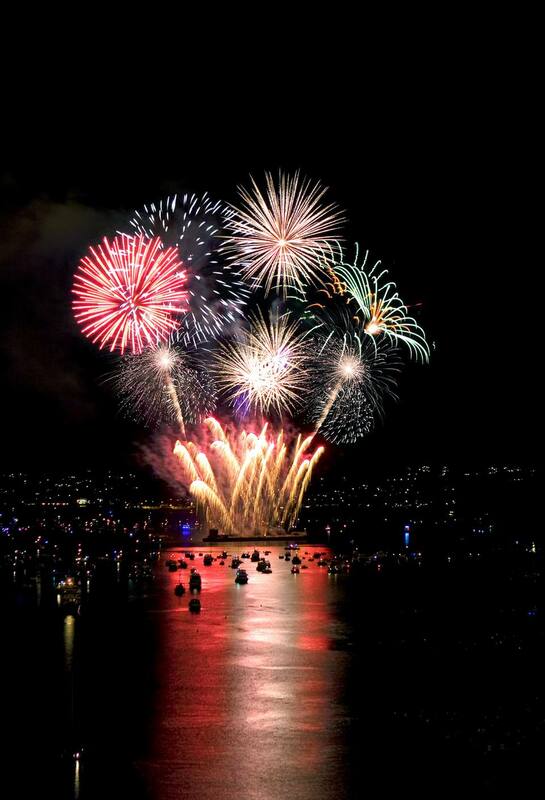 The Vancouver summer favorite lights up the skies over English Bay for in a musical pyrotechnic competition. There are various spots around Vancouver to get a good glimpse of the display, but it does get crowded, so plan ahead. Your best option may be to leave the car at home and use public transit or bike. The annual Kitsilano Showboat, which brings a variety of performers--including Flamenco and Tango dancers--to Kits Beach. Performances start at 7 p.m. every Monday, Wednesday, Friday, and Saturday through mid-August. The Enchanted Evenings Concert Series at the Dr. Sun Yat Sen Chinese Garden continues every Thursday through late August. Through Labor Day weekend, there's free ballroom dancing in Robson Square, in the heart of Downtown Vancouver. Free Summertime Fun in Vancouver, B.C.